Went up again this afternoon for my second lesson on stalls (“Advanced Stalls”). Kind of odd to be heading out to the training area with a different instructor. (Ashley again, with whom I did my first solo this morning). Weather has cleared a fair bit, we had a few clouds at 3,000 feet so much different from the past few days. An upwind departure in UFY from 29R and straight out to the training area. Ashley walked me through a few of the technicalities in terms of heights that need to be maintained between aerodrome and the training area, none of which really sunk in too much but I’m sure I’m about to get much more familiar with this detail! Climbing to 3,500 feet above a remote part of the training area we did our HASELL checks (see first stalls lesson entry for details) and then ran through some of the basic stalls that were covered in the first lesson. Basic power-off stall, power-on stall, stall with flaps. We then did what is apparently considered “advanced” stalling, which seems to entail how to handle a stall in a landing approach situation in which you’re typically at low speed, two stages of flaps out and not always 100% focused on the airspeed. Same procedure as other stalls: reduce power, extend flaps, then pull back on the control yoke to maintain height while the airspeed bleeds off and the nose of the aircraft gets higher and higher. Stall approaches when things go quiet, airframe starts to “buffet” and the stall warning indicator sounds. (Indicator failed to sound in UFY during this lesson, a fact which needs to go on the plane’s Maintenance Release post-haste). Did this a couple of times and then performed (satisfactorily) another basic stall so that Ashley could sign me off as being competent on stalls. Interestingly, the Warrior appears to be so stable as a training aircraft that it’s quite difficult to get it to drop a wing during a stall! If you have a wing drop in that situation, correct action is to apply firm opposite rudder to level the wing, then lower nose slightly and apply full power. But I wasn’t able to demonstrate the rudder technique as UFY simply would not drop a wing in the stall. (Actually, I was using a tiny bit of rudder to counteract what felt a bit like a tendency to drop wing, but the wing never went so far as to drop). Heading back to Bankstown I got some new exposure to inbound approaches. It was easier to spot the 2RN (radio) tower today, so we made our inbound call from there at 1500 feet and were cleared for a crosswind approach to runway 29 right. Joining the circuit for the runway I was high, so really had to throw out the anchors to lose height and ended up with a fairly poor landing (bang!) But what was really poor about this landing was the roll. Not sure what I did – maybe just touched a bit of pedal – but all of a sudden UFY was careering left and right and Ashley had to take over to control the landing roll. Urrrghhh. One of those cringeworthy moments you experience when learning to fly. I apologised to Ashley, of course, who was very good about it and told me (correctly) that I’ll get it right. But this is the 2nd time I’ve done that. I’m going to have to own up to John and ask him to help me make sure we get this sorted. I’m just glad I didn’t do this on my solo landing earlier in the morning! Anyway, chalk up another hour, and the completion of my stalls training (for now). OK, all in all, today was a better day. I was better (though by no means crash hot) at most things. And I had more fun. But it was still bloody intense. Any day with 2 hours of flying, I’ve come to learn, is a really long day. My ride today was Foxtrot Tango Uniform (FTU). (Apologies for the grainy look on left hand side – shot was taken with my Blackberry and the lens was obviously smudged). Unlike previous days, the aircraft was not waiting for me when I arrived – it was out on another lesson. When my instructor and student landed, they parked next to the clubhouse and it was immediately mine to inspect. All OK: fuel up to tabs on left hand tank, below tabs on the right, oil and brake fluid good. A quick wash of the windscreen. After a proper pre-flight and a chat about turns (turns in straight & level flight, climbing turns, descending turns), we taxied for runway 29 right. Run-ups completed, we taxied to holding point A5 at which point my instructor John surprised me by asking me to make the radio call to request clearance for takeoff. I flubbed it a bit – what I should have said was, “Bankstown Tower, Warrior Foxtrot Tango Uniform, ready two niner right for upwind departure, received Charlie”. (Charlie being the 3rd ATIS report of the morning – they do them in sequence, Alpha, Bravo, Charlie etc). But the tower either was being kind, or missed my poor call, because we received clearance to take off. Lining up on the runway and takeoff checks complete, throttle full open over 3 seconds and we were soon at 55 KIAS (knots indicated airspeed). I lifted the nose and we were away – need to remember not to lift up too much, need to allow the plane time to accelerate. Climbing to 1500 feet we levelled out before crossing the railway tracks that delineate the (Class D) traffic control zone. As I trimmed for 1500 feet things felt a little better than yesterday – didn’t seem to be struggling as much keeping the plane in balance. Once passed the tracks John told me to climb to 2300 feet. Trying to keep up a “best rate of climb” speed of about 80 KIAS, I did OK, until reaching 2300 feet at which point I failed to lower the nose enough and ended up around 2500. But John was nice enough to tell me that I was doing much better than yesterday. I replied that I was glad he thought so! The mantra before a turn is to check before the turn. If you want to turn left, first check right, then centre, then left to clear the area of any traffic that may present a hazard to you conducting the turn. Once done, start the turn using ailerons and rudder, and remember BBB – bank (angle of bank), balance (ball in the centre), back pressure (to keep up the desired altitude or airspeed as the turn robs the wings of some lift). Went OK. We returned to land on 29 right and John had me descending most of the way but it all got messy – I wasn’t keeping the nose down enough during base and final – so he took over and got us down safely. When descending – particularly with flaps – you really need a serious nose-down attitude in these small aircraft! I’ve got to get comfortable with finding the right nose-down attitude and sticking to it. You can’t keep the nose up at all – if you do, you won’t descend as required. Seems obvious when I look at it in writing, but it’s harder than it looks or sounds. Back on the ground at about 1115, I called the Shell people and had the fuel truck come round to fill to tabs on both tanks. Then into the clubhouse for a much-needed drink of water (my mouth was dry as after today’s flight – it’s a hot day, and the concentration and the cabin environment really dries me out). Grabbing a sandwich, John started to talk to me about radio calls. I’d been wondering when we’d start in on this. In a strange little way I’ve been kind of dreading it. I’ve often read or heard of people really struggling with their calls. I can understand why. Especially when you’re brand new to this game, you just wonder how the hell can you ever remember all the calls you need to make? How can you possibly give attention to what’s happening over the radio when you’re trying to do 10 other things? What you want and what your intentions are (eg. “for upwind departure request taxi”). I can see I’m going to have to do a lot of practise on my calls. A for airframe – is the aircraft correctly configured – clean wings, doors closed etc. L for lookout – are we clear of any traffic around/above and particularly below that present a hazard – we did a full 360 degree clearing turn to make certain of this. So we proceeded to do stalls. A stall is basically when a wing reaches a certain critical “angle of attack” relative to the oncoming airflow, above which angle the wing cannot generate enough lift to support the weight of the aircraft. Once the wing stalls – and particularly when both wings stall – the aircraft will lose altitude. Fortunately, training aircraft are pretty stable and it is hard to put them into a really serious stall and almost impossible to do so without plenty of advance warning. Signs of approaching stall include an onset of shaking/shuddering which you can clearly feel through the control column and through the airframe, and the sounding of the stall warning horn. This is a really nifty little safety device which sounds some 5-10 knots of IAS before you’re actually in a stall. They’re wonderful. I fell in love with them today. Variations including stalls in a turn, high-speed stalls. I had a wee bit of trepidation in actually intentionally stalling the plane – you really have to fight your instinct for self-preservation – but I went ahead and did it (in the words of George Orwell’s Winston Smith) just the same. Power as appropriate, lift the nose to watch the speed bleed away, keep firm back pressure on the control yoke, feel the stall come on. The shaking and shuddering starts. The horn sounds. Then you look at your VSI (Vertical Speed Indicator) and you see you’re losing height. Apply opposite rudder if a wing drops (right rudder for left wing dropping, and the reverse). In fact the aircraft basically refused to drop a wing, it was so stable! At the same time, lower the nose and apply full power. Watch the airspeed increase. Recover from the stall and level wings if necessary. OK. There will be more stall training. I don’t know if I’ll ever love it, but I don’t fear it as perhaps I did. It’s pretty easy to recover from. Setting cruise for Prospect Reservoir, we descended to 1500 feet and I did a reasonable (not great) job of straight & level flight. Over Prospect I radioed, “Bankstown Tower, Warrior Foxtrot Tango Uniform, over Prospect at one thousand five hundred, received Golf inbound”). The tower informed us to stay out of the control zone – by John’s assessment, they were in the process of switching over runways. So we continued north and a bit east to Parramatta, then made a 180 degree left turn and returned to Prospect. We made the same call again and were instructed to make our approach to runway 11 left. 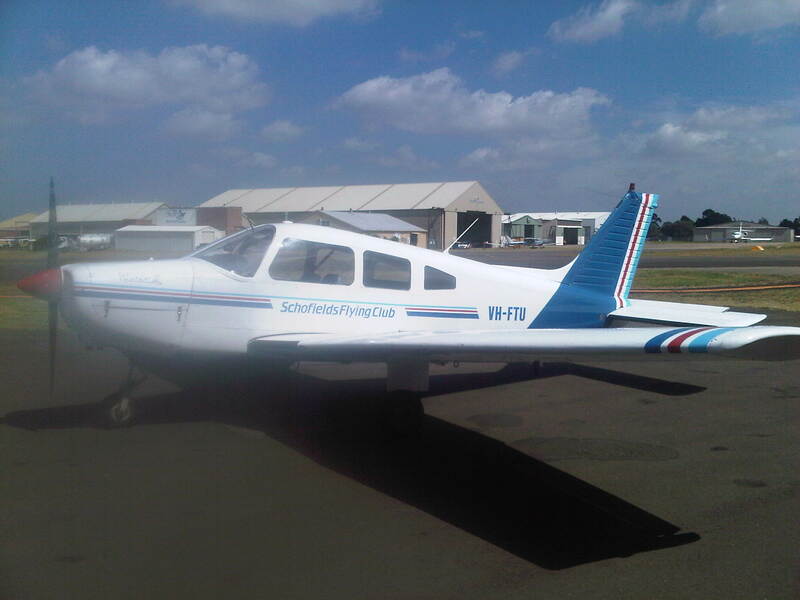 So we made for Warwick Farm Racecourse – by which I struggled to descend to 1000 feet but managed to – then turned on final. I did a better job of getting it down, but my alignment with the numbers of the runway was not great. Meanwhile I completed missed our landing clearance, which John handled. But he got us down, and some hard braking had us turning left off the runway. My final mistake of the day then happened! I did the unforgivable – tried to make my radio call to request taxi clearance while someone else was using the frequency! John jumped on me. Taxiing further, I finally made the correct call, then we taxied back to the clubhouse, shut down and tied down. Maintain a listening watch on your radio frequency. Never make a transmission when someone else is in mid-call! John was kind enough about it afterwards. He seems like a decent instructor and bloke – but quite rightly, he has to jump on mistakes like that. I guess it’s how we all learn. Wow. What a full-on day. But, 2.2 more hours in my logbook, some improvement, and a heap of learning. It’s really coming towards me in a tsunami now. Tomorrow just 1 hour, depending on weather, will be either more stall work, or a ground briefing about circuits. So we’re coming up on circuit training … stay tuned.